ROCHESTER – Tanner Andrews admitted that it was one stressful day Tuesday. It also turned out to be one of the most rewarding days of his young life. 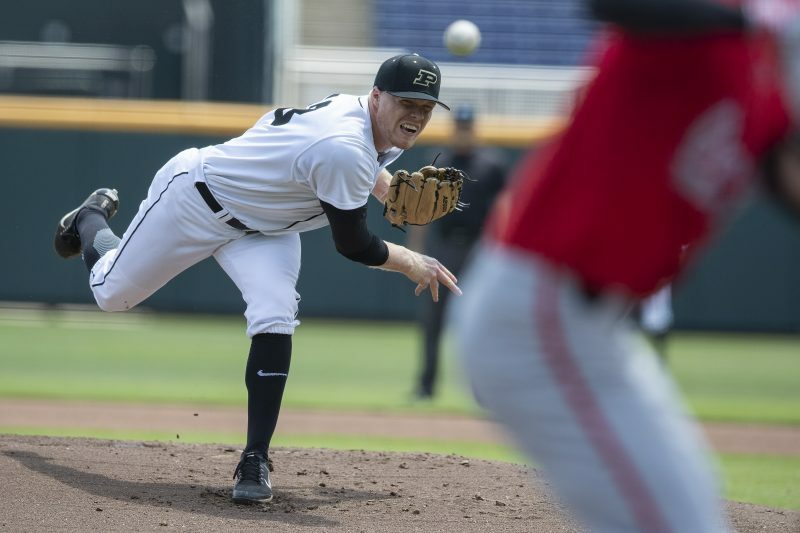 Andrews, the ace of the Purdue pitching staff, achieved one of his lifelong dreams by being drafted in the 10th round of the Major League Baseball Draft. Andrews, who just finished up a stellar senior season by leading Purdue into the NCAA Tournament, was the 297th overall pick taken by the Miami Marlins. Andrews, who starred in baseball, football and basketball during his prolific prep career, drove home to Rochester Tuesday morning to spend time with his family, girlfriend and close friends as he awaited the call he has worked his entire life for. Andrews helped put Purdue baseball back on the map the past two years. The Boilers went 38-21 this season and earned a spot in the NCAA Tournament for just the third time in program history. Andrews earned third-team All-Big 10 honors as the No. 1 starter for the Boilers. He also earned All-Big 10 Tournament honors and was Purdue’s Sportsmanship Nominee for the conference. Purdue was 10-44 just two years ago. They finished 29-27 a year ago before having a breakthrough season this year as they finished second in the Big 10 regular-season standings and second in the conference tournament, losing to Minnesota in the championship game. Andrews, a 6-3, 220-pounder right-hander, fashioned a 7-5 mark on the hill this season. He posted a 2.94 ERA with 78 strikeouts and 4 walks in 98 innings pitched. Andrews got the start last Friday night as Purdue faced Houston in a first-round game of the Chapel Hill Regional. The Boilers closed out the season with a loss to Houston on Sunday in the double-elimination format of Regional play. 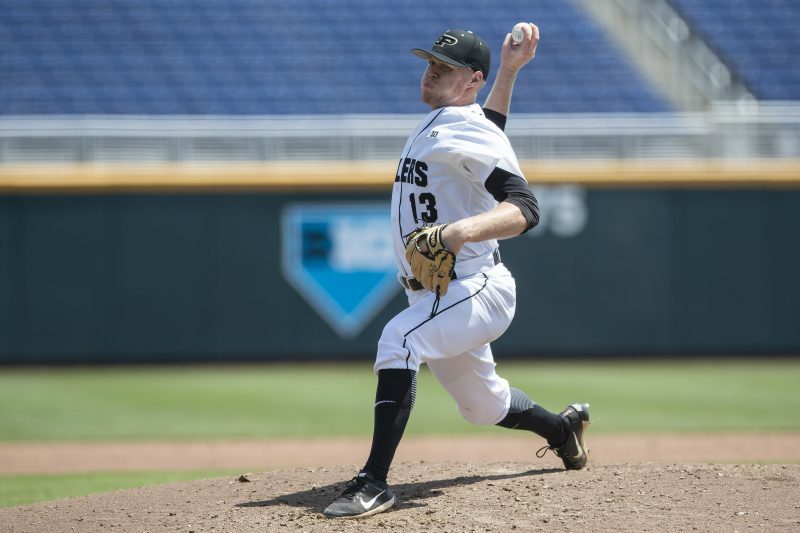 Andrews, who also earned All-Academic Big 10 honors, is the highest drafted Purdue pitcher since Nick Witgren was tabbed by the Marlins in the ninth round back in 2012. Andrews, who sported No. 13 for the Boilers, is the son of Todd and Margaret Andrews. His father played baseball at Grace College and his older brother Brody was also a baseball standout. Andrews was not the only Purdue player taken on Tuesday during the second day of the three-day draft. His battery mate, junior catcher Nick Dalesandro, was taken just 12 picks later by the Arizona Diamondbacks. Dalesandro, whose father Mark played in the Majors, hit .297 this year with 15 doubles and 27 stolen bases. Dalesandro was drafted in the 33rd round by the Detroit Tigers back in 2015. The draft began Monday with the first two rounds. The draft continued Tuesday with rounds 3-10 and concludes Wednesday with rounds 11-40. Andrews, who went 8-4 his junior season, will next sign a contract and then head to a minor league destination likely in the next couple of weeks. Tanner Andrews led Purdue to just its third-ever NCAA Tournament appearance this season.